It seems like only last week I was reviewing another platformer for the Nintendo Switch… wait… that was last week. While it’s fair to say the console’s indie support has been nothing short of fantastic, there’s little arguing the abundance of platformers we’ve been specifically receiving. While it may not sound like a bad thing when said aloud, it does make it tough combing through them all and locating the true gems of the bunch. So where exactly does Joggernauts land? On paper it sounds like an interesting twist on the genre putting a strong emphasis on team play, but how well does it actually work in practice? Joggernauts may look like your typical auto-scrolling platformer but its one where you’ll be controlling between two and four characters as opposed to just the one. In fact, even if you’re playing alone instead of with a group, you’ll still be tasked with controlling a pair of aliens. 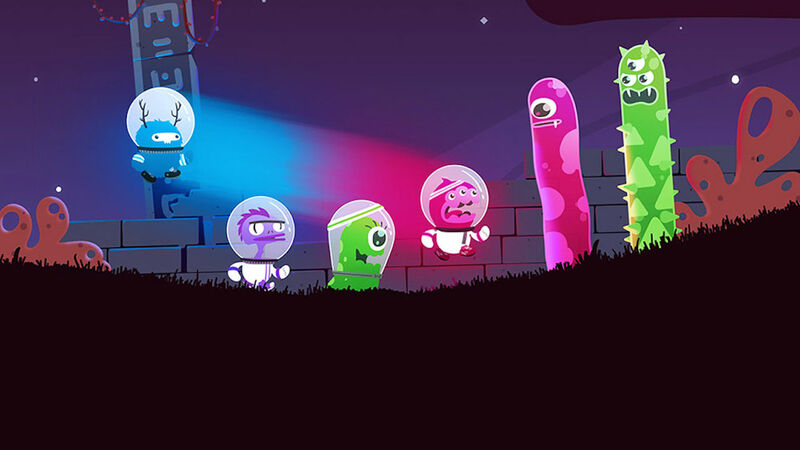 Forming an orderly line you’ll need to not only time the jumps of each alien to avoid enemies and bottomless pits but also change the order of your line so the leader’s color matches that of any potential roadblocks that may lie ahead. So for example, if up ahead you see a pink enemy blocking your path then you better make sure you have your pink alien in pole position to take it out. It’s not just enemies either, things like switches and invisible platforms also needing the correct colored alien to manipulate them. Whether it’s to reach a collectible or simply make it to the finish, switching the order of your team is key. The game also features an interesting checkpoint system making them only usable in a stage if you’ve collected enough gems littered throughout the stage to pay the fee. Don’t have enough? Then it’s back to the start should you lose all your lives. It’s a neat idea in theory but since gems are also color-coded, gathering them can make things even trickier on yourself resulting in them being more of a nuisance more than anything. The controls in the game are extremely simple. Playing in multiplayer, one button handles your jump while another teleports your character to the front of the line. If you’re on your own however you’ll have one jump button for each of the two characters you’ll be controlling. It’s easy to pick but tough to get your head around especially if you opt for the latter option. While multiplayer can be a chaotic mess at times, it feels manageable since you can focus on your one character while the other two or three players handle theirs. Playing alone however you’re now suddenly responsible for two including timing when to make them each jump but also when to switch them. It doesn’t feel particularly natural and makes simple obstacles far more frustrating to traverse. In fact, it’s all too easy to lose your stockpile of lives in quick succession should you lose your rhythm. Granted this can also happen in multiplayer but at least then you blame someone else and laugh about it. Joggernauts is rather unsurprisingly at its best when played with a group, its switching mechanics far better suited to a team of players. Allowing four uniquely colored aliens to get involved adds a far heightened level of chaos you simply won’t have if you’re on your own. Similar to the Overcooked series of games, communication is key, every colored obstacle often an excuse for everyone to start panicking to get the appropriate character to be leading the pack. While playing this way can certainly be more confusing and clustered with four of you all shouting orders and trying to time your actions as a unit, it’s also the far more satisfying one too. The feeling of going from absolute failure of a level to grabbing everything within and making it to the finish is enough to keep you playing. Joggernauts’ story is spread out across three moons each one a linear map linking you to the game’s numerous stages. Progression is locked off based on how many collectible trophies you’ve found, so you may find yourselves having to repeat past levels to reach the target amount. As for the levels themselves, they are relatively short and with around twenty in all, you’ll find yourself having seen everything the game has to offer fairly quickly. Even with two collectible trophies tucked away in each stage and unlockable characters to find this is a short experience. Joggernauts is a surprisingly fun take on the auto-scroller but a fairly short one filled with its fair share of frustrating moments. As a single player experience it feels clumsy but gather a group of friends and there’s a good amount of amusement to be had even if most of the time it’s from everyone yelling at each other and trying to orchestrate themselves. A short, simple and laugh-filled time.